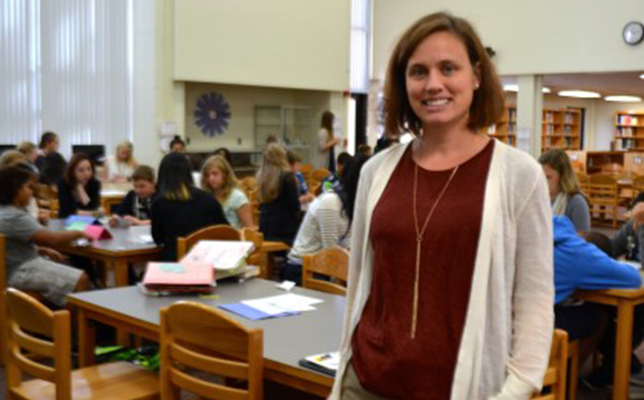 Liz Kolb, associate professor at the University of Michigan, at a middle school in the Ann Arbor Public School District. Image courtesy of AAPS District News. Background: K–12 classrooms are experiencing a massive investment in computing technology. As we have reported in the blog post before, 50 percent of America’s classrooms appear to be at 1-to-1 with 100 percent coming up over the next five years. The eternal question: "Ahhh, and what are teachers supposed to do with all those computers?" Liz Kolb’s new book "Learning First, Technology Second: The Educator’s Guide to Designing Authentic Lessons" is, IOHO, an excellent tool towards helping teachers answer that eternal — and vexing question. Before diving into our review, we (CN & ES) feel that we need to be clear: We are prime Kolb supporters and we support the Triple E Framework explored in her book. Now, let’s dive into the book! Well, not so fast (smilely face goes here). Who is Liz Kolb and why did she write this book? Liz Kolb was a classroom teacher for 20 years. Currently, Kolb is a clinical associate professor in the School of Education at the University of Michigan where her primary instructional responsibilities are teaching pre-service and in-service teachers how to use technology in the classroom. So, not only has Kolb personally struggled with using technology in the classroom, she deals with hundreds of teachers who are struggling with using technology in their classrooms. Bottom line: with respect to using technology in the K–12 classroom, Kolb knows of what she speaks. One more fun fact: In 2008, Kolb wrote "Toys to Tools: Connecting Student Cell Phones to Education," and in 2011, Kolb wrote "Cell Phones in the Classroom: A Practical Guide for Educators" — a now classic book in how to use cell phones in the classroom. Like we said: Kolb knows educational technology. Now, we are ready for the book review! The title of the book: "Learning First, Technology Second" is really important. It is well known that schools tend to buy technology first and then try to figure out what to do with it. (Example: The failure of this strategy in Los Angeles has been well documented in the media.) But regardless of the district’s technology strategy, Kolb’s book directs the individual classroom teacher to first identify her/his learning goals, and then to identify how technology can be used to further the learning. What is "authentic engagement" then? 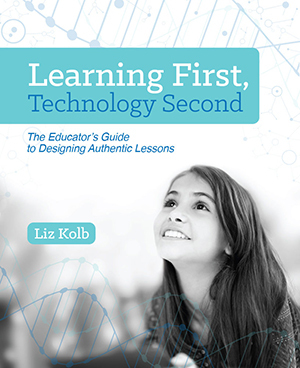 Liz Kolb's book, "Learning First, Technology Second." "This book shares what authentic engagement looks like, sounds like, and feels like in the learning." "The [Triple E Framework] introduced in this book, will allow teachers to put the needs of the learner first and then select the technology tools that leverage authentic engagement in the instructional goals." Causes a shift in the behavior of the students, where thy go from being passive to active social learners. Creates paths for students to demonstrate their understanding of the learning goals in a way that they could not to with traditional tools. Allows students to grow as learners in a lifelong way, so they do not need the school setting to continue to use the tools." So, in developing a lesson plan, a teacher can use the Triple E Measurement tool to evaluate the degree to which the lesson addresses each of the three conditions (listed above) for each of the three E’s. The teacher gives a score of 0, 1 or 2 for each of the nine conditions making 18 the maximum possible score for a lesson. In her book, Kolb shows how the Triple E Framework relates to the various theories of technology adoption (TPACK, SAMR), how it relates to the ISTE Student Standards, and the book provides a broad range of concrete examples of the Triple E Measurement Tool applied to specific lesson plans. Each chapter is summarized in a section entitled "Chapter Take-Aways" — "Take-Aways"? A teacher term if ever there was one. Suggestion: Start by visiting with the Triple E Framework website. Visit the "about" page where it expands on the explanations of Engage, Enhance, Extend. Definitely click to the Triple E Rubrics and Tools page where the measurement tool is provided. Then, when you are energized, order the book! "Technology tools cannot do the work of good teaching." Stay tuned: Kolb will shortly be introducing the TripleEPLN — the Triple E Personal Learning Network — a website to support the growing community of teachers who are finding the Triple E Framework a useful, teaching and learning tool. For more info on the TripleEPLN contact: tripleEpln.info@umich.edu.